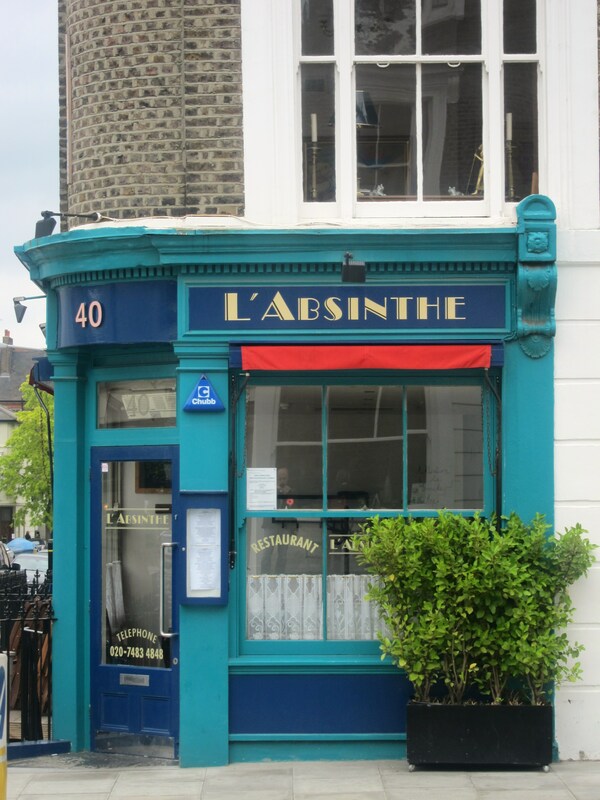 L’Absinthe is a pleasant little bistrot on a lovely street in Primrose Hill. 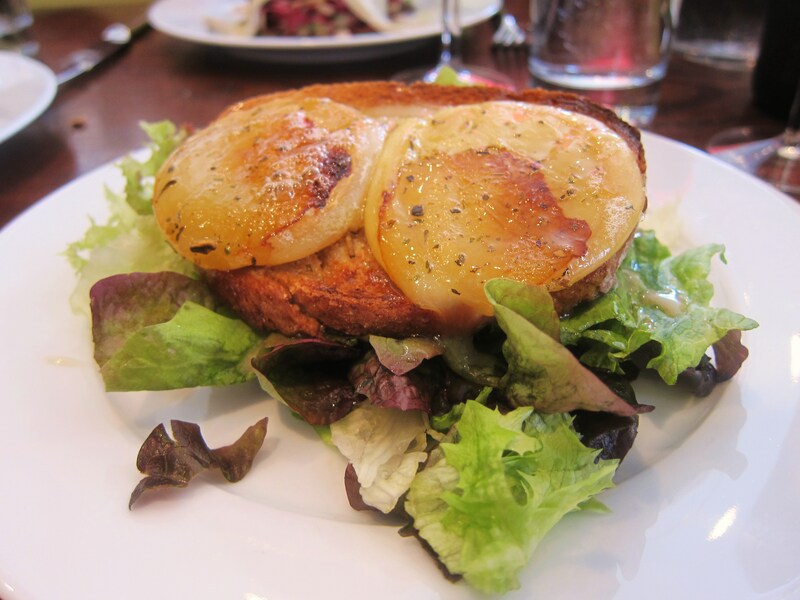 The simple food is executed well and is very reasonably priced. Their wine, which they also sell on a retail basis, is only marked up £10 when you order it during your meal, and they have a short but interesting selection to choose from. But the main thing about L’Absinthe is that their passion and joie de vivre shine through, and they have made it into the type of neighborhood restaurant you wished you had just around the corner from your home. I will certainly be returning. I am not sure why I’ve suddenly decided to review a pair of places in Primrose Hill – but alliteration aside, they are both worth it. My last review of Lanka, the cafe serving French pâtisserie with a Japanese twist, is about a five minute walk away from L’Absinthe, which is just off Regents Park Road (which functions as the High Street of the neighborhood). 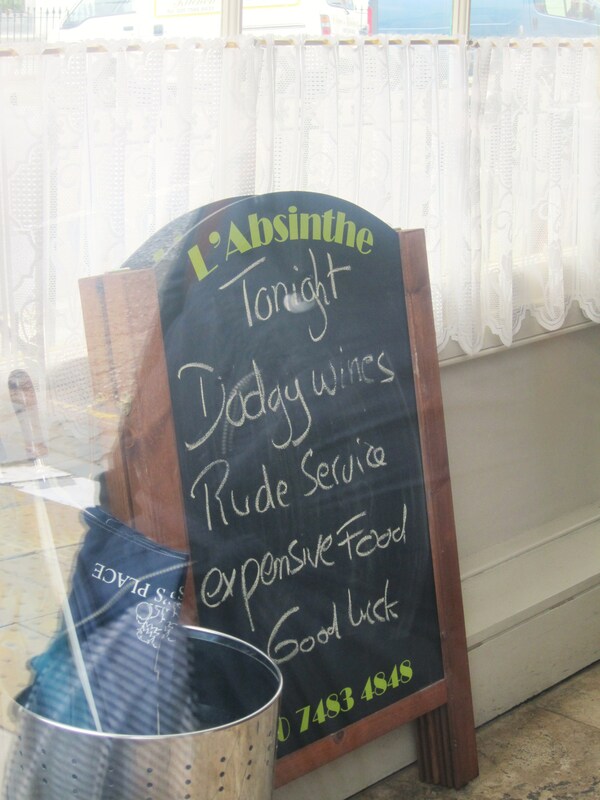 Located on an attractive, wide intersection on Chalcot Road, L’Absinthe is a French bistrot-style restaurant and retail wine shop. 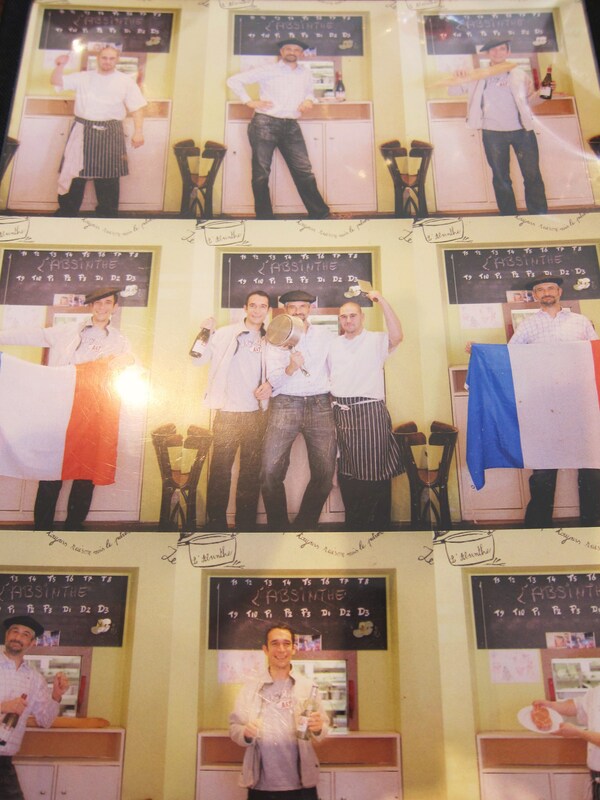 It was set up in November 2007 by a group of Frenchmen, all with impressive backgrounds. The proprietor is Chef Jean-Christophe Slowik, and he worked in the front-of-house under Marco Pierre White for roughly 20 years at many of his well-known ventures. When Slowik decided to go solo, he enlisted help in the form of well-respected chef Christophe Favre, who has worked with Michel Rostang in France and also at the Bleeding Hart in London. At the Bleeding Hart, Christophe met Jean-Marc Charre, who was recruited to L’Absinthe’s front-of-house, along with Jena-Marc’s colleague Laurent Valentino. Laurent was running the floor on our visit, and he is one of the most pleasant hosts I’ve come across in London. The restaurant has both upstairs and downstairs dining rooms. Upstairs is light and airy, with a motif of green – presumably a reference to its namesake. There are a total of 30 covers, with one long rectangular communal table as you enter, a few shelves of wine, and then a number of simple wood tables on a slightly raised level, with a little window to the kitchen at the back. There is also terrace seating available outside – I believe about five tables – when the weather is nice enough to warrant it. The downstairs room was not open when we were there for our Saturday lunch, but seemed perfectly pleasant and houses another 34 covers. The bar also resides below, and there is direct access from the kitchen as well. We had walked past the place earlier in the week, when it was unfortunately closed, and I recalled some foodie friends of mine going here about a year ago and saying it was good, so I made a mental note to keep it in mind next time we were in the area. That just happened to be a few days later, so we took another look at the menu posted outside and decided that the bistrot fare looked appetizing and reasonably priced, plus it looked like everyone there was having a good time. Upon being seated, some bread was brought to our table to keep us occupied. It was of the basic sliced variety (which seemed store-bought, but I didn’t ask) and was freshly toasted for each table, a nice touch. The butter was particularly good, and it is homemade on the premises according to one of the waitresses. As I perused the wine list, I noticed that they seem to have a strong relationship with (or affinity for) the champagne house Thiénot, as the brand features on the cover of their wine list and also on the awning of the restaurant. Alain Thiénot is quite a well-regarded figure in the Champagne region, and also runs a number of other brands besides the one bearing his name, including Canard-Duchêne. 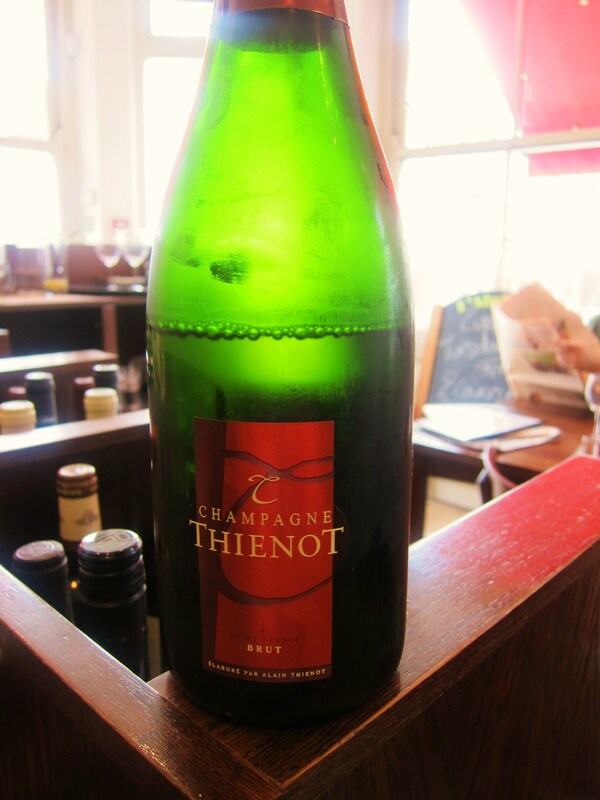 I decided to sample a glass of the Thiénot Brut NV, which is the house champagne (£6.95), and thought it was very nice. It had a good citrus kick to it, without being overly harsh, and also displayed a pleasant creaminess and fairly elegant mousse. The bubbles did not seem particularly fine, but I thought it functioned well as a house champagne and was not overly expensive. A funny and charming touch was that Laurent left the rest of the bottle on the table once he had poured my glass, and said nonchalantly that I could have the rest of it if I wanted (the bottle was more than half full). I think he was sort of serious and it was this warm and slightly cheeky attitude that helped to make it an enjoyable afternoon – it was as if we were already very old and loyal customers, when he’d only met us in the last ten minutes. Mrs. LF opted to have two starters for her lunch. 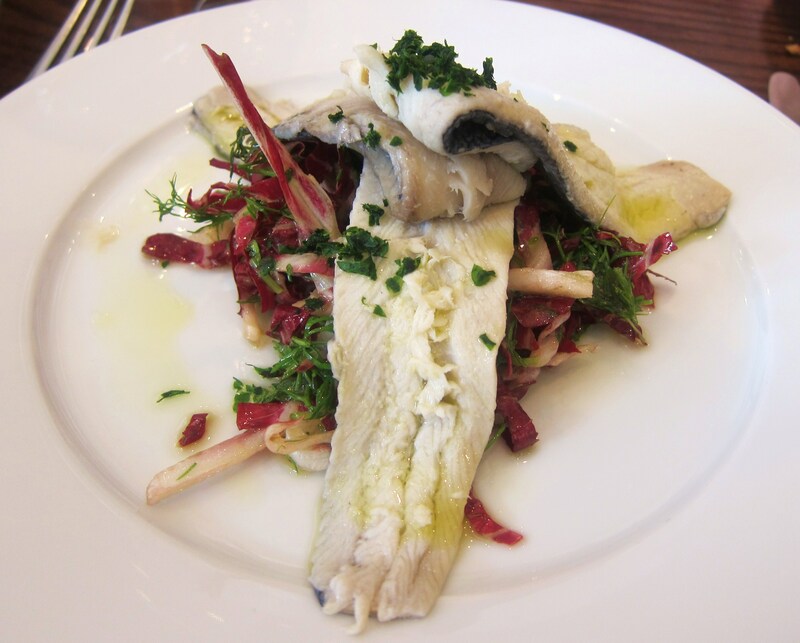 First up was the marinated herring (£4.95), which was certainly a generous portion and attractively presented. The marinade was good and not overly sweet or strong (we asked if it was marinated on the premises, and the waitress said it wasn’t), and the texture of the herring was pleasantly soft and firm enough. It worked very well with the slightly sour radicchio and herb salad, and was a very satisfying starter. 7/10. 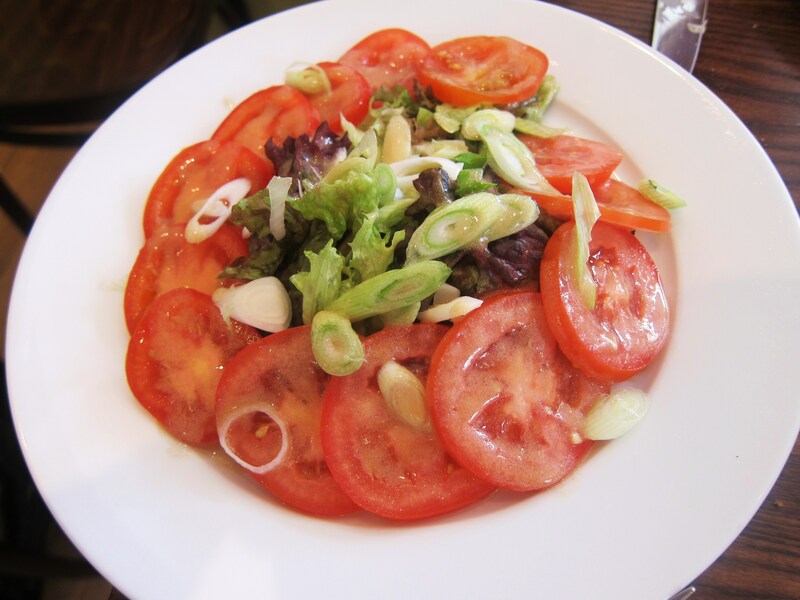 The second half of Mrs. LF’s meal was a simple salad of tomatoes and spring onions (£5.25), which also came very prettily presented. The tomatoes were nice and sweet and the spring onions were very mild. What made the dish, and tied it all together, was the very good vinaigrette, which Mrs. LF said reminded her of France – in a good way. 7/10. 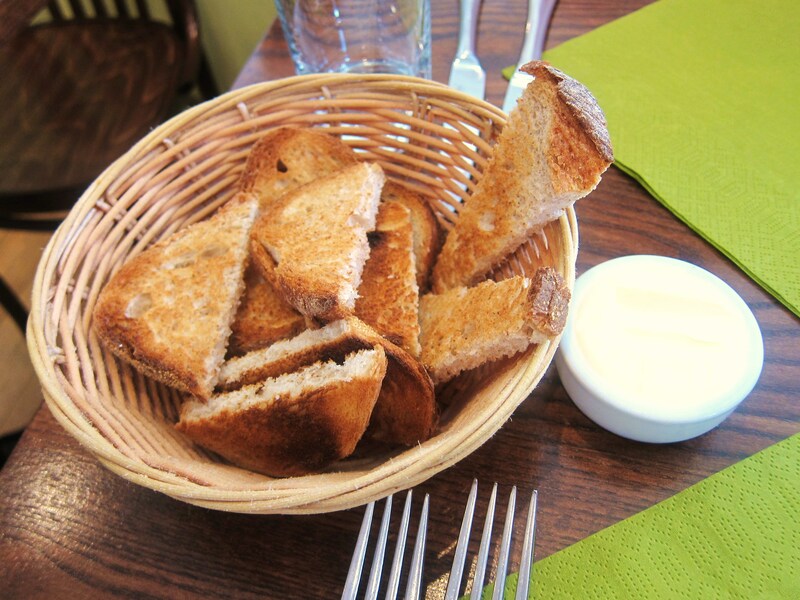 I ordered the goats cheese on toast with a honey dressing (£6.25) and really enjoyed it. I suppose it doesn’t get much simpler than this, but it was well executed and the produce itself was good. The ever-so-slight sourness and saltiness of the cheese was lifted by the light sweetness of the honey dressing and the vinaigrette added a nice streak of acidity, so everything was well balanced. I would order it again if I was in the mood for this kind of dish. 8/10. 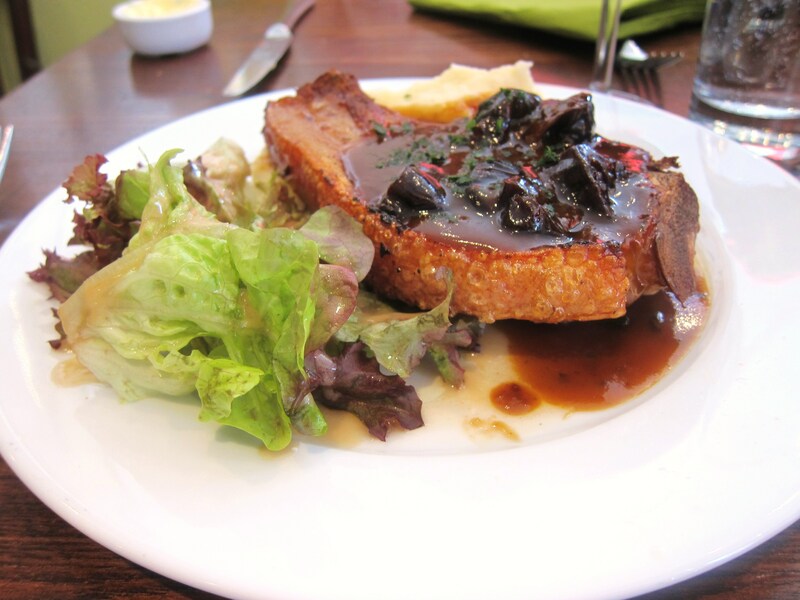 My pork chop with prune sauce (£10.95) was also plated up nicely. We noticed almost immediately that the crackling looked very crisp (always a good sign) and inferred that it was probably slow-cooked. The pork chop itself was well cooked, retaining enough moisture and having a nice clean flavor (it wasn’t overly ‘porky’ – even in the crackling, which can sometimes have too harsh of a taste for me). The prune sauce was a natural flavor combination, and this was very nicely carried out, with bits of the macerated prunes strewn throughout the purée, providing good texture. As we had anticipated, the crackling was indeed very crispy (so much so I couldn’t cut it with my normal knife), and I really enjoyed it, as well as the dish as a whole. 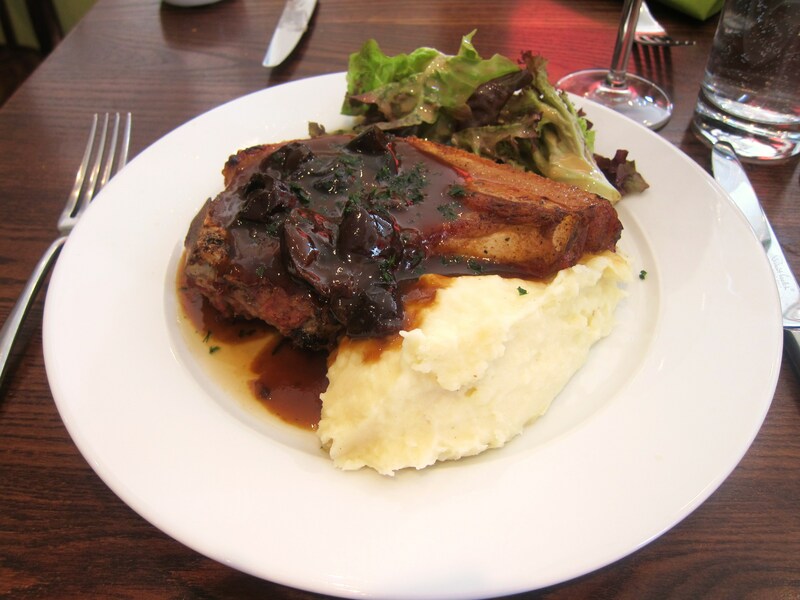 The only let-down on the plate was the mash, which tasted okay but was too dry and grainy – we expected more from the French kitchen as, when we dine in France, the mash tends to be more rich and creamy. I’m not saying I expect Robuchon standards everywhere. Well, yes I suppose I do actually – after all, it’s only potatoes, butter, milk/cream and seasoning whisked up to be very light and airy, and a French bistrot should be able to pull that off well. 7/10 (it would have been an 8/10 if a bit more effort had gone into the potatoes). 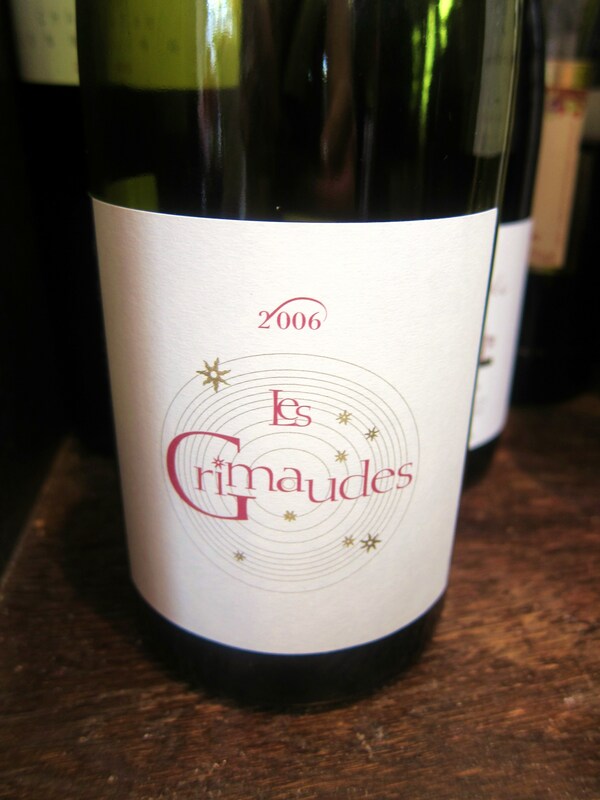 Laurent had recommended a glass of the 2006 Les Grimaudes (£4.95), a biodynamic wine from the Vallée du Rhône (Costières de Nîmes to be exact) to go with my pork chop. It is a blend of Grenache, Carrignan and Cinsault grapes and has a very small production of some 26,000 bottles per year. I thought was a lovely little table wine. It was less heavy than I expected it might be, and I thought the Grenache provided a nice fragrance and lightness to wine. It was just fruity enough, very fresh and had ripe and fairly supple tannins. Laurent also poured way more than a normal-size glass without a second thought – I was beginning to like this guy. Also of note, and as I briefly mentioned earlier, is the fact that L’Absinthe has a dual function as a retail wine shop. They sell all of the wines on offer at retail price and simply charge a £10 corkage fee on all of the wines when you order them at the restaurant. There is a very interesting if short selection. It is French-focused, though there are offerings from elsewhere in the world – from Chile to Italy. It is a list made up of interesting producers, many of which I was not familiar with, which is always fun. After the savory business was out of the way, we decided we still had a bit more room left for dessert, especially as we had spied one that we definitely liked the look of at another table. Mrs. LF’s chocolate and coffee mousse (£4.95) was very good, with the coffee flavor coming through just enough. It was rich as a result of the dark chocolate base, but this is the type of mousse I prefer as I often find chocolate mousses to be too lightweight to my taste. 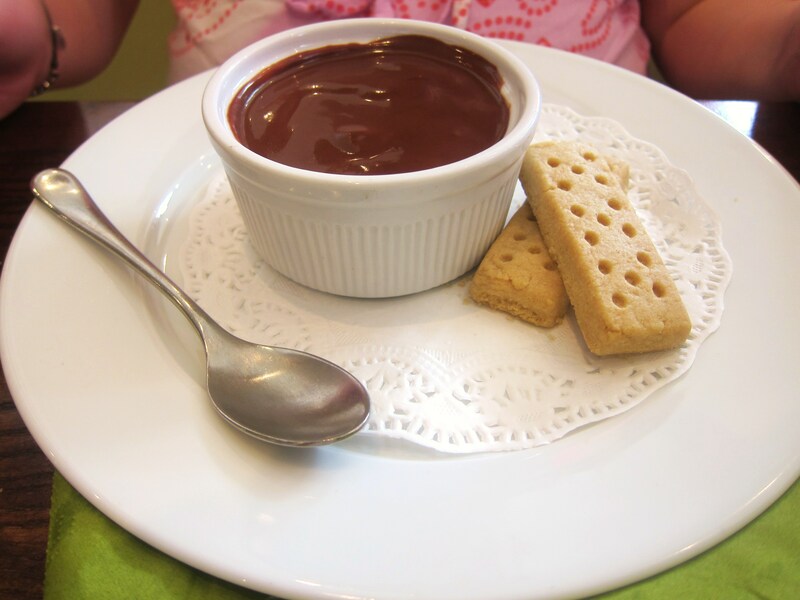 The shortbread served on the side was nice, and I enjoyed dunking it into the mousse, although Mrs. LF would never contaminate her mousse with foreign particles of any kind ;-). 7/10. 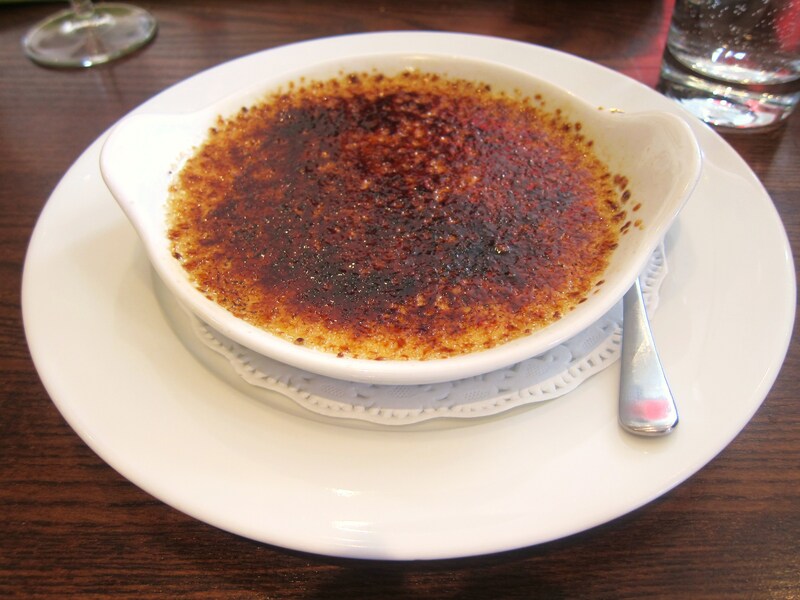 I loved my dessert, which was the house crème brûlée (£5.50). The little spin here is that the custard is actually infused with a bit of the lethal absinthe spirit. I thought it was a stroke of genius as it had been injected very subtly but consistently throughout so that you detected just a little hint of anise in the background. It also created a gentle heat in the middle of the mouth, alluding to the power of this spirit, which Van Gogh and his drinking buddy Gaugin knew all too well. It was a highly satisfying and delicious dessert. Given the quite large portion, I am pleased to say I didn’t get bored of it either – often, I get sick of something which has the same consistency, texture and flavor throughout when there’s a lot of it – and enjoyed every last bite. (Oh, the carmelized crust was perfectly crispy as well). 9/10. 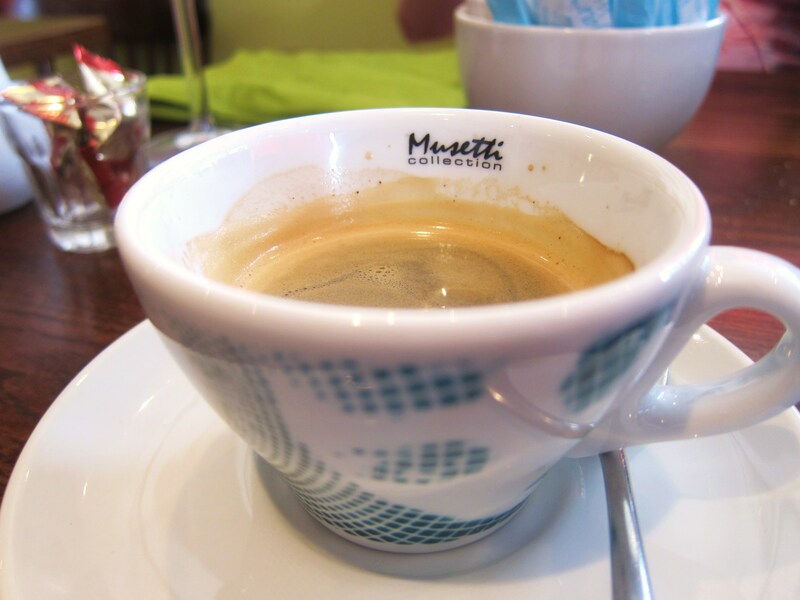 I decided to finish off our lingering affair with a single espresso, courtesy of Musetti beans, which was very good. 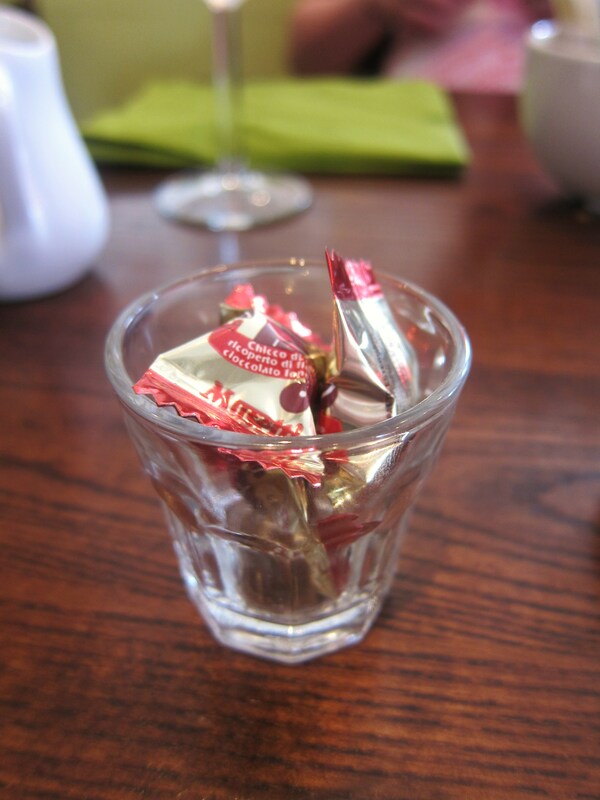 A nice little touch was the fact that they served some chocolate-covered coffee beans (also Musetti) alongside the coffee. I always enjoy these, and even if it seems rather Italian to me (rather than French), it was appreciated. The bill, presented in that now-familiar green shade, came to a reasonable £58.05 including wine, service and VAT. I’m glad we didn’t dine the night before! 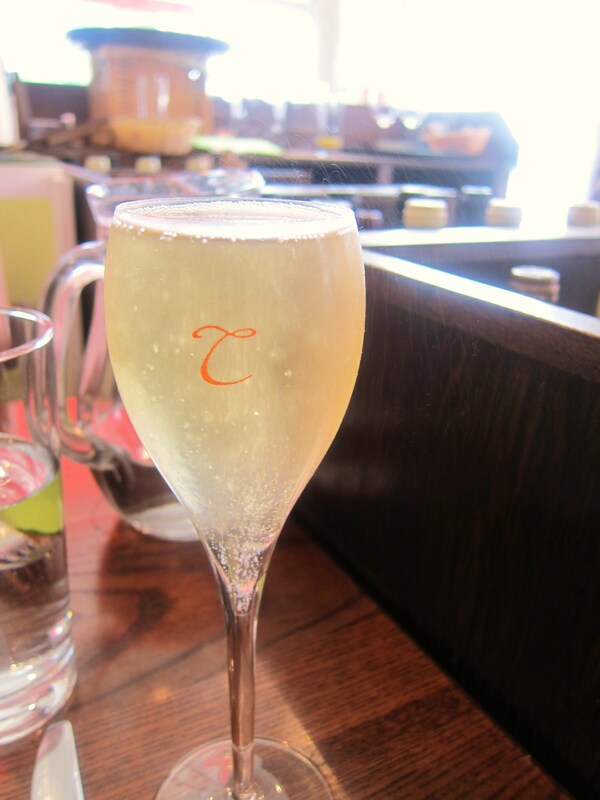 We had a really enjoyable long lunch at L’Absinthe. The food was simple and tasty throughout (with a few memorable dishes and no sour notes), but what made it such a memorable afternoon was the atmosphere, service and spirit of the place. They clearly have passion and seem adept at the art of customer interaction – and it’s nice that this hasn’t been lost after being in business for well over two years now. As we sat inside the little corner restaurant, it almost really felt like we weren’t in England anymore and had been transported to France. It had the same acoustics as a good bistrot and the feeling of a place to which you’d want to return. Mrs. LF said she was sure that this is the kind of place where regulars would be welcomed, recognized and rewarded by the staff, and I am sure if I lived in Primrose Hill, I would certainly be one of them. Luckily, we don’t live too far away, so I may still become one anyway. 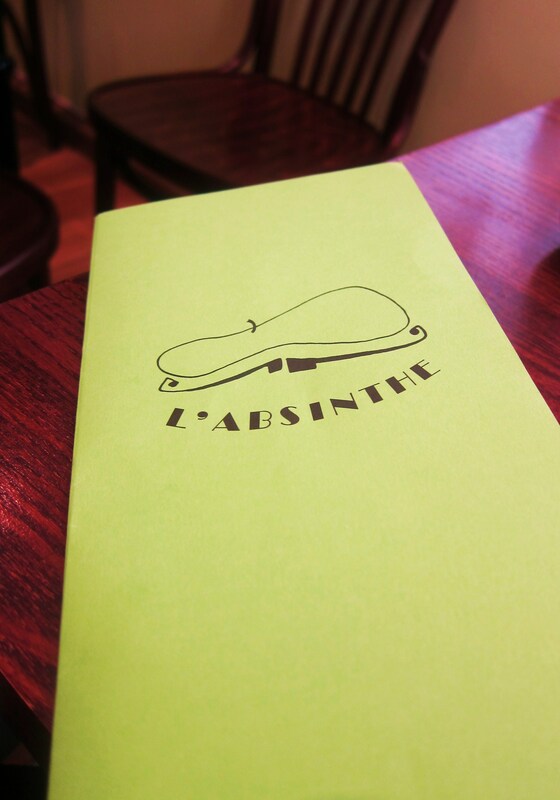 Wine: as mentioned previously, L’Absinthe has a dual function as a retail wine shop. They sell all of the wines on offer at retail price and simply charge a £10 corkage fee on all of the wines when you order them at the restaurant. There is a very interesting if rather short selection. It is French-focused, though there are offerings from elsewhere in the world – from Chile to Italy. It is a list made up of interesting producers, many of which I was not familiar with, which is always fun. For more about my rating scale, click here.